Sittow was popular in his day, painting for several monarchs, yet this is the first monographic exhibition of the Estonian's work. Just as the National Gallery of Art was about to close its widely heralded "Vermeer and the Masters of Genre Painting" in its premier exhibition space, it was hanging the works of an earlier Northern European artist in a gallery off to the side. " Michel Sittow: Estonian Painter at the Courts of Renaissance Europe" lacks the branding power of Vermeer and is unlikely to draw his crowds—sadly. No-shows will be missing out on a superb exhibit of paintings by a powerful, somewhat mysterious painter who deserves to be better-known. 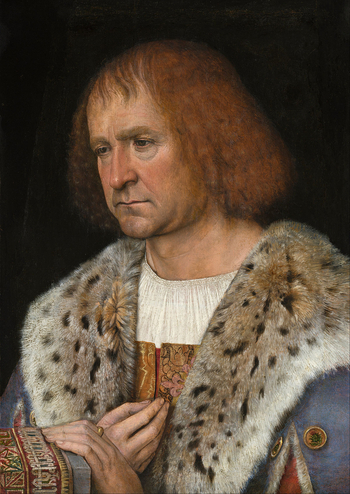 Sittow (c. 1469-1525) was popular in his day, painting for monarchs including Isabella of Castile, Margaret of Austria and Christian II of Denmark. He was born in Reval, now Tallinn, the capital of Estonia. He first studied with his artist father, then left in his mid-teens for Bruges, where he is thought to have been a pupil of Hans Memling, the city's pre-eminent artist. He was hired by Isabella at age 23—as her fifth-highest-paid official—and moved with her court around Spain from 1492 to 1502. He also traveled to Brussels, Copenhagen, back to Tallinn, and probably elsewhere in Europe. Yet this is the first monographic exhibition of his work. It came about as part of Estonia's celebration of the 100th anniversary of its proclamation as an independent republic in 1918, following the dissolution of the Russian Empire. The National Gallery was a natural partner because it owns two paintings by Sittow, including the brilliant "Portrait of Diego de Guevara (?)" (c. 1515/1518), which is arguably his best work. Correction: his best known work. Sittow apparently never signed his paintings. In records, he is listed under various names and confused with others with the same given name. His works were copied. Over the years experts had attributed some of them to Jan Gossart, Hans Holbein the younger or others, and he was largely forgotten until the early 20th century. Despite attempts to catalog Sittow's works, no one knows the extent of his surviving paintings: a 2011 catalogue raisonné lists 111 works as by Sittow but confirms him as the artist in only 13 cases. All but one of them—his "Christ Carrying the Cross" (c. 1518/1525)—is here. Owned by the Pushkin State Museum in Moscow, it was not lent because a court ruling in a completely unrelated claim could allow American authorities to seize any Russian artwork in the U.S. in enforcement. They are accompanied by some "attributed to" and workshop paintings, plus a sampling of works by Memling, Gossart and Juan de Flandes, who also served Isabella. Sittow's paintings fall into two categories: portraits and small religious narrative scenes, including two commissioned by Isabella as part of a 47-piece devotional suite. One, "The Ascension of Christ" (c. 1500/1504), is a delicately rendered tableau unfortunately marred by dark varnish and water damage. 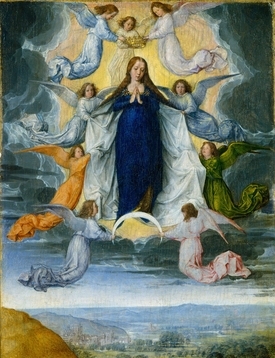 The other, "The Assumption of the Virgin" (c. 1500/1504), is incandescent [bottom right]—a demure Mary, clad in a dazzling blue robe and attended by a flock of angels, rises above the earth, shown as a little landscape, to meet a gleaming gold crown, held in place by three additional angels. Here and there, Sittow piles up the paint—adding a three-dimensional glint to that crown, for example. Still, while admittedly difficult to judge from such a small number of works, Sittow's greater gift seems to lie in his portraits. Finely modeled, refined in style, rendered in rich but subtle colors, they usually share the pose of many of Memling's works—a three-quarter view of the sitter against a dark background. They are very true to life, down to tiny details like the dirty fingernails and stubble on the face of "Portrait of a Man" (c. 1510), which was once attributed to Jan van Eyck, and the deep furrow between the eyes in "The Portrait of the Man With the Pearl" (1515-17). Where Sittow seems to outshine other painters of his era is in the way he paints textiles, like the diaphanous veil draped over the forehead of "Portrait of a Woman" (early 16th century), and textures, especially fur, like the mink collar worn by the man with the pearl. They are completely realistic, showing color variations, wear and natural folds. These talents all come together exquisitely in the De Guevara portrait [above right], which was part of a diptych, and its other half, "Madonna and Child" (c. 1515/1518). A Spanish courtier and ambassador (who once owned Van Eyck's masterpiece, the "Arnolfini Portrait"), De Guevara looks adoringly at the infant Jesus in a way best described by the exhibition catalog—"with a pensiveness bordering on melancholy that in its humanity is without parallel in early Netherlandish art." 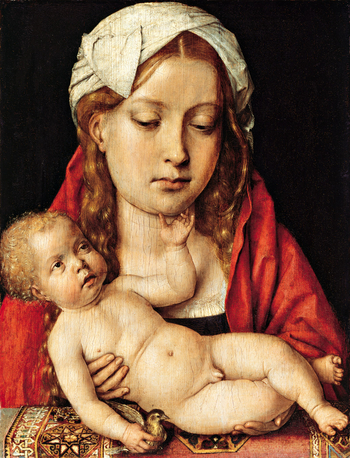 Mary and her baby [top left] are less distinctive in their pose and emotion, but very tender: With downcast eyes, she looks lovingly at her child while he touches her chin. This rewarding exhibition, curated by the Gallery's John Oliver Hand and Greta Koppel of the Art Museum of Estonia, left me with a fanciful hope: that a search of storerooms and attics would turn up more paintings that can be reliably attributed to Sittow.